The weekend of February 23rd, 2019 is not one that will be left out of the history books of Sheridan, Wyoming. Families came from far and wide to discover what Sheridan has to offer during the winter time. Up and coming country artist, Ian Munsick graced the stage of the WYO Theater on Sheridan’s Historic downtown. 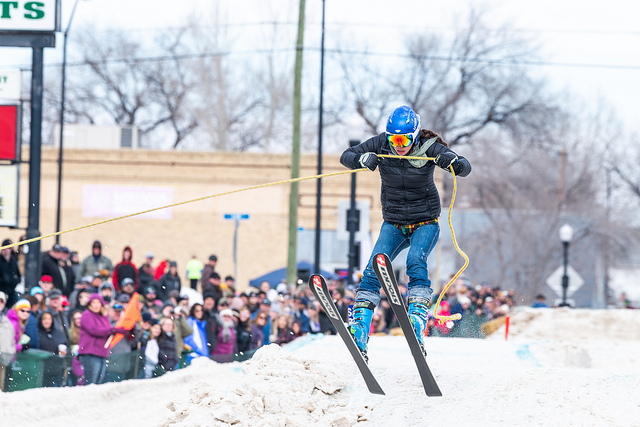 The marriage of western tradition and outdoor recreation took place on Saturday morning at 9 a.m. when the National Anthem was sung, the flag was flown and the first ever skijoring race was run in Sheridan, Wyoming. The 1st Annual Sheridan WYO Winter Rodeo took the town by storm by bringing in 107 Skijoring teams consisting of one horse, one rider, and one skier. This made us the biggest Skijoring event on the Skijoring America circuit for the whole year, only being surpassed two weeks later by the National Finals Skijoring in Red Lodge, Montana. 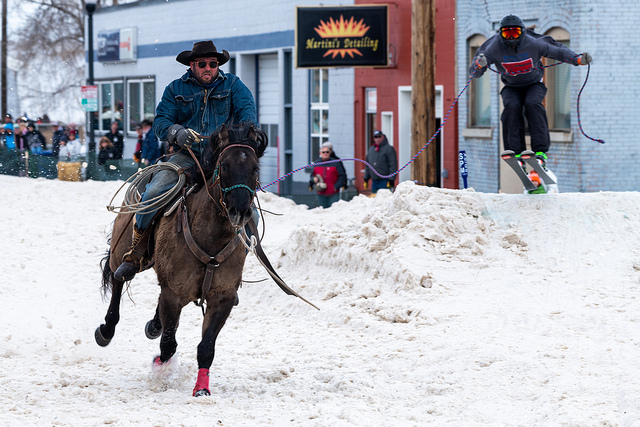 The Sheridan WYO Rodeo skijoring course began at Luminous Brewhouse where coffee and regionally famous Bonafide donuts were being served and ran south on Broadway with the finish line at Black Tooth Brewing Company. Food Trucks and vendors placed at both breweries were sold out early in the day and the sidewalks were packed with rowdy fans enjoying the sunshine on a February Saturday morning. Not only did we attract participants and spectators from Montana, Colorado, South Dakota, Idaho, Vermont, Washington, and many other states, but the local support and interest was more than we could’ve hoped for or imagined. With over 50 teams from the Sheridan Area, we see a future for skijoring in Sheridan, both in our outstanding athletes and our very successful Sheridan WYO Winter Rodeo. When we say successful, we mean successful. We talked to a few local businesses about the success they saw during this one-day event. Several business owners suggested that it was like a weekend in July in the middle of the winter. The 1st Annual Sheridan WYO Rodeo brought light to the vibrant activities that take place in Sheridan in the winter time. What has been thought to be a dull season in Sheridan, winter took on an entirely new persona, revealing the opportunities that the little white stuff that we call snow holds. Following the skijoring races on Saturday, families loaded up the sleds, snowshoes, cross country skis and fat bikes and made their way to the Red Grade trails on Sunday where the Sheridan Community Land Trust provided snacks and warm drinks to the attendees of the Family Fun Day. Hockey teams battled for the win at the M&M’s Center in Sheridan during the busy winter weekend. We even had a Women’s Snowmobiling Clinic hosted right here in our very own Bighorn Mountains by Off the Grid Outdoors. The truth is that the weekend of February 23rd, 2019 isn’t too much unlike any other weekend during the wintertime in Sheridan. The fresh powder in the Bighorns always welcomes skiers, snowmobilers and sledders alike. Groomed trails throughout Sheridan County are always open to snowshoers, fat bikers and cross country skiers, guides in the area are excited and willing to take anyone who wants to experience the pristine snow of the Bighorn Mountains, and the local breweries are always slinging some of the finest craft beer in the country.